Moto Z 2017 Specifications Leaked: With Snapdragon 835 and 4 GB RAM: Last year in June 2016, Motorola launched Moto Z with high-end specs including the latest processor Qualcomm Snapdragon 820 and 4GB of RAM. It also featured a 2,600 mAh battery, Android 6.0 Marshmallow OS, 13-megapixel rear camera and 5-megapixel front selfie camera. 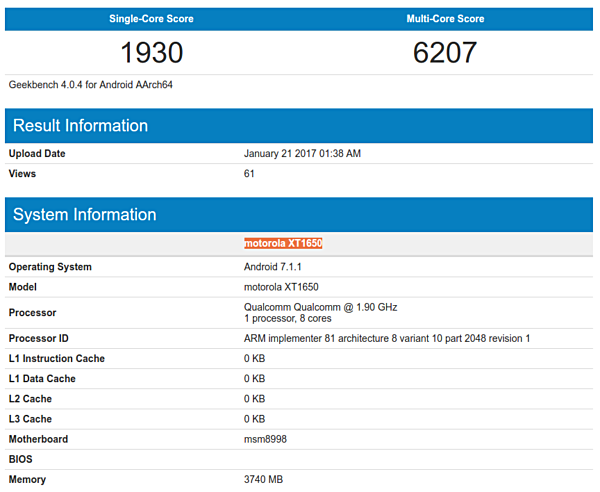 Now upcoming Moto XT1650 smartphone was spotted on the Geekbench benchmarking platform along with key specifications. It could be the sequel handset of Z model dubbing as Moto Z 2017. It could be launched alongside the Samsung Galaxy J7 2017 which is also expected to be launching at MWC 2017. According to Geekbench listing data, Moto XT 1650 will be powered by Qualcomm’s latest Snapdragon 835(specifically 1.9 GHz Octa Core Qualcomm MSM8998 SOC) chipset backed with 4GB of RAM. Listing data also reveals that the Motorola XT1650 will run on Android 7.1.1 operating system out of box. Snapdragon has been officially launched in the market but is yet to install on any device but is expected to come in Xiaomi Mix Evo, Surface Phone, and Samsung Galaxy S8. Unfortunately, we don’t know much about this flagship handset as of now but we can safely assume above model (XT1650) to be the well Moto Z (2017).